Cracks in the vetting process mean small government contractors with questionable track records score lucrative government projects. Oct. 24, 2015: An editor’s note has been added to this article. In 2006, the Mongolian Finance Ministry hired a small Chicago-based consulting firm called Glocoms to strengthen its budget planning. The $1.5-million job, financed by the World Bank, aimed to help a country still grappling with Soviet legacies reallocate its spending and reduce its debt. Unfortunately, the company’s consultants didn’t always show up and their reports were riddled with errors, said Zahid Hasnain, who oversaw the project for the Bank starting in 2008. Glocoms was supposed to send employees, he said, but instead subcontracted the work to another company. After Bank investigators took a broad look at Glocoms’ work and concluded that in Mongolia it had misrepresented the availability of key staff, causing “performance deficiencies,” the contract was cancelled, according to a debarment notice. But the small contractor had aspirations beyond Mongolia. The investigators also concluded that Glocoms had misstated its qualifications when bidding for contracts in Ethiopia, Iraq, Vietnam and the West Bank and Gaza – in a total of 49 instances, according to a Bank press release in 2010 and notices it issued in 2011. The Bank blacklisted the firm and its owner in 2010 for four years, and a year later, extended the punishment until March 2018. That didn’t stop Glocoms from getting new contracts from federal or global public institutions, including the U.S. government, a Center for Public Integrity investigation shows. After its World Bank debarment, Glocoms landed dozens of contracts and earned nearly $9 million for providing services to U.S. agencies, mostly the Department of Defense, according to FedMine, a firm that aggregates federal contracting data. These included assignments to supply flight surgeons, paramedics and hazardous waste disposal personnel. Since 2014, Glocoms has received nearly $5.9 million in U.S. government revenue, according to FedMine data, with at least $1 million dollars from federal contracts this year alone. The Center’s investigation found that troubled small government contractors like Glocoms can readily get new contracts for a host of reasons. U.S. agencies have no mandate to take international sanctions into consideration when awarding contracts. And many international or U.S. contracting officers conduct only superficial vetting of small contractors, while keeping imperfect databases on problematic conduct. The international institutions that pay for this work – including the World Bank – most often leave it to others, such as local governments, to ensure that those doing the work have clean records. The governments, in turn, often have few tools and little ability to investigate past work by small or foreign contractors that they are not financing themselves. While some contractor matchmaking firms – which place consultants and short-term workers at government agencies — operate honestly, others appear to operate on the margins of the relatively loose domestic and international rules that govern such work, or step over them. The profits can be considerable, and the scope of the work – and its potential impact, either good or bad – is often substantial. Their duties can range from advising governments on cargo security to reforming national regulatory bodies to supplying medical services staff. Federal spending on service contracts that include this type of work increased between 2000 and 2012 by 90 percent, adjusted for inflation, to reach $259 billion — more than the $244 billion spent on salaries and benefits for regular civilian federal employees. In 2014, nearly two-thirds of federal contracting dollars were spent on services rather than goods. And in fiscal year 2015, roughly a quarter of all federal contracting dollars went to small companies, amounting to $90.7 billion. In eleven of Glocom’s contracts with U.S. government agencies, including the Millennium Challenge Corporation (which helps administer U.S. foreign aid), the Army, and the Fish and Wildlife Service, the firm had problems meeting agreed requirements, and in two other cases it failed to provide the qualified staff it had promised, according to documents obtained through public records requests and staff at the agencies that oversaw the contracts. These included contracts to inspect munitions, provide surgical technicians for the Army, and to clean government facilities. While federal rules require that contracting officers take steps to ensure that all vendors are responsible, ethical and experienced, they aren’t required to consider past sanctions by international institutions such as multilateral banks, even when those show a pattern of fraud. For awards below $150,000 – mostly reserved for small firms like Glocoms – officials aren’t even required to update or check databases on performance and integrity or to document any concerns. “The government seems willing to make some trade-offs to support small businesses, figuring that it’s smaller dollars, and therefore [it] puts itself at risk of hiring a contractor that has a poor track record and isn’t qualified to get the job done,” says Scott Amey, general counsel at the Project on Government Oversight, a nonprofit watchdog organization based in Washington. The address provided on the Glocoms website turned out to be a mailbox at this UPS Store beneath a street-level Chicago Starbucks. The Glocoms Group Inc. was formed in Chicago in March 2004 by Cameroonian-born Maurence Anguh. 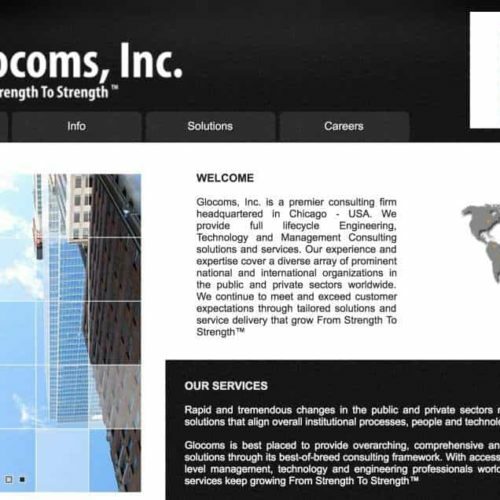 The firm’s website displays a motto that it had trademarked until March 2015 — “From Strength to Strength” – and the catchphrase: “You can trust us today, tomorrow and thereafter.” The site says that Glocoms has taken on 140 projects in more than 50 countries, and has offices on five continents. The address specifically listed on its website is for a mailbox at a UPS Store beneath a street-level Chicago Starbucks. Anguh declined to comment about his work practices or debarment after multiple attempts to reach him over the phone, by email and in person. During a reporter’s 2013 visit to Anguh’s Chicago home address, Anguh said on the street outside that he did not want to comment. In December 2014, after several more attempts to reach Anguh and his business partners, he said he would pursue legal action if the Center’s reporters continued to contact him or other Glocoms employees. After Anguh’s wife filed for divorce in 2008, he told a judge that Glocoms had never had any permanent employees, and relied instead on more than 50 consultants, including his wife’s uncle, according to a 2011 judgment in Cook County Circuit Court in Illinois. But a July 2013 Dun & Bradstreet report obtained by an Army contracting officer said Glocoms had 78 employees and $15 million in sales, as of May that year, while FedMine’s listing for the firm in June– based on the company’s self-reporting to the government – cites 10 employees and $700,000 in revenues. In a 2011 proposal to supply a flight medicine physician at a Texas Air Force base, Anguh listed five others – including Humphrey Anyele and Yufanyi Vifansi — as his company’s “senior managers,” and described how he used “celebrations like surprise high tea parties, small outings and sporting events [that] keep the spirit alive and maintain vibrancy at work.” In testimony to the divorce court judge that year, however, he described Anyele and Vifansi as consultants. The company’s phone answering service offers extensions for Anguh, Anyele and Vifansi, and for two others named Mimi Feigenson and Emmanuel Asongwe. Anyele and Asongwe could not be reached, Feigenson declined to comment, and LinkedIn profiles for all but Anguh list them as holding different jobs for other firms. Vifansi, whose profile describes him as a project manager at a Chicago energy company, said in a 2014 telephone interview that it was simple for Glocoms to craft successful proposals for government agencies. “It’s a very easy thing. Anybody can do it,” he said, adding that he no longer worked for the company. In September 2003, Anguh won a $186,000 World Bank-financed contract in the company’s name to advise Romania’s insurance regulator. Over the next six years, Glocoms and its affiliates got at least 27 other consulting contracts worth $4.4 million in Bank-backed projects, mostly in Africa. These included jobs auditing financial accounts in Angola, helping West African authorities track the transit of cargo, and planning how to reduce attrition in the Gambian civil service. The borrowers of World Bank funds – usually local government agencies – are supposed to check the qualifications of consultants; Bank staff provide a checklist “to help procurement officials detect fraudulent qualifications and related types of misconduct,” a senior Bank official said, but themselves review less than 35 percent of the 20,000 contracts awarded each year, according to the Bank’s data. Government agencies that get World Bank funding are required to check its debarment list as well as similar lists compiled by other multilateral banks. But neither the Bank nor its borrowers have an easy way to tell if contractors who aren’t blacklisted failed to perform on past projects or had contracts canceled, because the Bank doesn’t systematically track and share this information, according to spokesman David Theis. “The Bank’s role is to make sure that the borrower’s work is done properly, that the agreed procurement procedures are observed, and that the entire process is conducted with efficiency, fairness, transparency and impartiality,” he said. The Bank thus typically debars companies for fraud or other misconduct only when a complaint leads to an investigation, he noted. In Glocoms’ case, the Bank’s investigative arm, known as the Integrity Vice Presidency, began looking into the company in 2007, focusing on a $660,000 contract that Glocoms received in 2006 to help a Vietnamese bank reform its payment system. Investigators concluded that Glocoms had “misrepresented its capacity and commitment in the proposal,” according to the Bank’s final report on the Vietnam project. By 2011, they described a pattern of misconduct by Glocoms, according to sanctions notices. The company had misrepresented references to its past experience while bidding for contracts in five projects, according to two notices that Pascale Dubois, the Bank’s evaluation and suspension officer, issued in 2011 recommending further sanctions. Besides the job with Mongolia’s finance ministry, these included bids for projects to strengthen Ethiopia’s financial sector, build local government capacity in the West Bank and Gaza, and develop emergency hydropower in Iraq. “The fact that they provided bad advice meant that money was wasted,” said Hasnain, who oversaw the Mongolia project for the Bank. In June 2011, the Bank extended its debarment of Glocoms and Anguh for four years, until March 2018. The notices spelling out sanctions noted “the repeated pattern of [Glocoms’] misconduct,” which “spanned numerous Bank-financed projects over an extended period.” They explained that Glocoms hadn’t complied with all of the investigators’ requests and that Anguh “did acknowledge that the information in the experience references at issue was incorrect.” Glocoms did not contest the 2011 sanctions. Bank spokesman Theis, who would not comment specifically on Glocoms, said it can take the Bank years to uncover fraud because it lacks law enforcement powers, and both the contractors and the governments hiring them may wish to conceal wrongdoing. “The nature of such cases is that two of the three parties (the Bank being the third) are seeking to cover their tracks and hide evidence, thus misconduct can occur over long periods without being uncovered,” he said. Theis added that in 2010 the Bank created a database that alerts its own staff if a firm is on investigators’ “radar screen,” even if it hasn’t yet been sanctioned. But the Bank hasn’t typically shared the contents with any other organizations. Because the World Bank doesn’t have a formal cross-debarment agreement with the United Nations, Glocoms continued consulting for the United Nations Development Programme in Somalia in 2011 after it was debarred by the Bank, receiving almost $62,000, UNDP spokesman Dylan Lowthian said. The U.N. suspended work with Glocoms in 2013, after a reporter informed it of the Bank’s debarment decision. U.N. spokesman Farhan Haq said that it ordinarily checks the Bank’s debarment list, among others, when registering companies and awarding contracts but offered no explanation for the three-year delay in taking action. While it was working on Bank-financed projects, Glocoms ran into trouble with the Millennium Challenge Corporation, a U.S. federal foreign aid agency. In Georgia, Glocoms was picked as a procurement agent for a nearly $300-million project to build roads and a natural gas pipeline spanning the country. In Armenia, it was awarded the job of preventing fraud, waste and abuse in a $235-million project to bring roads and irrigation projects to three-quarters of the country’s rural population. Glocoms stood to receive $9 million for the two contracts. In 2007, however, the MCC terminated Glocoms’ contract in Armenia because it switched key staff members and made subcontracting arrangements without approval, according to MCC spokeswoman Laura Allen. The same year, the MCC suspended Glocoms’ contract in Georgia after the inspector general for the Agency for International Development opened a probe into it, Allen said. It was then terminated in 2008, when MCC found a new contractor to do the work, she said. Glocoms was paid nearly $2 million in total, and neither contract was officially terminated for cause, MCC spokeswoman Renee Kelly said. Despite its problems with the MCC, Glocoms since 2010 has won dozens of contracts and received a total of nearly $9 million from the U.S. government, including at least $6 million from the Defense Department, according to FedMine data. Glocoms has an active listing in the government’s registry of contractors eligible to receive federal funds as a potential vendor for 57 services, ranging from environmental consulting to physician services to newspaper publishing. In one of these contracts, Glocoms beat out two competitors to win an $800,000 contract in Aug. 2013 to inspect munitions at the Blue Grass Army Depot in Richmond, Kentucky. The contract gave Glocoms three days to outline its radiation safety plan and provide a list of radiographers qualified to X-ray projectiles. It missed both deadlines, according to a copy obtained by the Center of a letter contracting officer Patricia Brown sent to Anguh in September 2013. Glocoms submitted credentials for seven candidates the following week, but technical experts found that none had proper certifications, according to the September 2013 letter. “The experience of trying to get this contractor to understand and deliver under this contract leads me to believe it will not be in the government’s best interest to continue dealing with him,” a colleague wrote to Brown in a Sept. 2013 email. The following month, a different contract officer cancelled the contract “for cause,” according to the termination letter. The Army also ran into more problems with Glocoms. In March 2015, it terminated a custodial services contract with the company because its janitors were perennially late or absent, according to a letter from contracting officer Steven Bailey. The following month, in April 2015, the U.S. Fish and Wildlife Service canceled two contracts with Glocoms to provide janitorial services at facilities in North Dakota and Montana. Both were terminated for cause because of the company’s “continued poor and/or non-performance,” according to agency spokesman Ryan Moehring. Similarly, in November 2014, the Air Force terminated Glocoms’ contract to supply a Catholic religious education coordinator at an Alaskan base because the company hadn’t submitted qualified candidates nearly two weeks after the person was supposed to start work, according to a letter the Air Force sent Anguh in October 2014 and a contract modification signed in December 2014. Although only four terminations officially faulted Glocoms’ performance, the company had at least four other federal contracts canceled early under the “for convenience” rubric. This type of cancellation allows government agencies to terminate a contract without stating why or explicitly blaming the consultant. In at least three other jobs, including those for the U.S. Army Corps of Engineers and the Department of Veterans Affairs, Glocoms had trouble meeting requirements, according to agency staff and documents. It wasn’t possible to find out how Glocoms performed in all its U.S. contracts, because federal policy bars release of some performance assessment records. But some of Glocoms’ other U.S. contracts were carried out smoothly, according to government records and staff. Some experts say many of the shortcomings in the review of small contractors could be fixed if federal contracting officers had access to more thorough and reliable information. While U.S. rules require such officers to verify that firms have a “satisfactory record of integrity and business ethics” and a “satisfactory performance record,” they don’t have to consider whether the firms have been subjected to sanctions by international organizations such as the World Bank. The U.S. system aims to ensure firms are “presently responsible,” regardless of past behavior, while the World Bank’s procedures aim to punish companies for misconduct. The Bank in recent years has referred cases to national authorities, such as the U.S. Department of Justice, if firms appear to have broken domestic laws (it made 22 referrals globally in fiscal year 2015). But it stopped doing so for most cases in 2015, while a Canadian court decided whether the Bank must open its archives and force its staff to testify whenever a referral led to a prosecution. (Theis declined to say whether the Bank told the Justice Department about Glocoms’ debarment). U.S. federal contracting officers have discretion to conduct a basic Google search about individual firms, though they aren’t required to do so (the top five searches on “Maurence Anguh” or “Glocoms” include an account of the World Bank sanctions). International debarments also aren’t captured in the Federal Awardee Performance and Integrity Information System, a database established by the General Services Administration in 2010 as a one-stop-shop for federal contracting officers to review past performance evaluations, U.S. lawsuits, federal suspensions and debarments, and terminations for cause on government contracts from the previous five years. “It would be in the government’s interest to know about international debarments, either to ask additional questions or to look for competitors who have a better record,” says Amey of POGO, which is urging that the database be expanded to include World Bank sanctions. U.S. contracting officers don’t even have to consult the database when handing out awards below what’s known as a Simplified Acquisition Threshold — generally $150,000 — most of which are set aside for small businesses such as Glocoms. They also aren’t required to report on contractor performance for awards below that threshold. John Shoraka, an official at the Small Business Administration, says the simplified procedures reflect a balance between risk and efficiency. “With small businesses, we know it won’t always be 100 percent. It’s a price range where acquisitions need to happen quickly. The thought process is that with the dollar amount, there is less risk to the federal government and therefore we should allow some efficiencies to occur. You can close that risk, but you won’t get any business done,” he said. Shoraka added that he believes the risk of fraud is mitigated by allowing interested third parties, such as rival contract bidders, to protest acquisitions and by suspensions and debarment of bad actors. “The Army’s contracting officers monitor contractor performance for all contracts, irrespective of dollar value,” said Army spokesman Dov Schwartz. “They are required to make an affirmative determination of responsibility for each contract, to include consideration that a contractor has a satisfactory performance record.” He declined to comment on why Glocoms continued to get Army contracts after its 2013 termination for cause by the Army or to say whether contracting officers were aware of its World Bank debarment. One problem is that many federal databases are incomplete, with performance data recorded only about half the time on average, according to an Aug. 2014 GAO report. Every agency fell short of the 100 percent compliance rate for fiscal year 2015 set as a target by the Office of Federal Procurement Policy in 2003. Glocoms hasn’t slowed down. In the past year, as part of at least $1 million dollars the firm has obtained from the federal treasury, the U.S. Army Corp of Engineers hired it to provide advanced life support services; the Federal Bureau of Prisons asked it to provide phlebotomy, dental and radiologic services for inmates; and the Indian Health Services awarded it a contract to provide a diabetes specialist for 37 health care programs. The results remain to be seen. This story was reported with the support of the Toni Stabile Center for Investigative Journalism at the Columbia Journalism School.